GIZA, Egypt (AP) — Mohamed Salah and host Egypt will face Congo, Uganda and Zimbabwe in the group stage of an historic African Cup of Nations this year, the first time the tournament will field 24 teams and be held in the European summer. As host, Egypt was one of six seeded teams for Friday’s draw and will open the tournament against Zimbabwe in Group A in Cairo on June 21. The toughest test for Salah’s Liverpool teammate Sadio Mane and Senegal, another seeded team, will likely come from Algeria in Group C, which also includes Kenya and Tanzania. Defending champion Cameroon and Ghana were grouped together in Group F with Benin and Guinea-Bissau. Group D is arguably the toughest, with Morocco, 2015 champion Ivory Coast and South Africa drawn together with Namibia. Nigeria will face Guinea and two tournament debutants in Madagascar and Burundi in Group B.
Tunisia, Mali, Mauritania — another first-time qualifier — and Angola make up Group E.
Egypt is hosting after Cameroon lost the right because of poor preparations and security concerns. Eight teams have been added and the tournament, which is usually held at the start of the year, has been shifted to June and July, the European offseason. That means Africa’s Europe-based stars won’t be faced with the dilemma of leaving their clubs midseason to play at their continental championship. Salah will undoubtedly be the face of this African Cup, which will be played at six stadiums in four cities: Cairo, Alexandria, Suez and Ismailia. 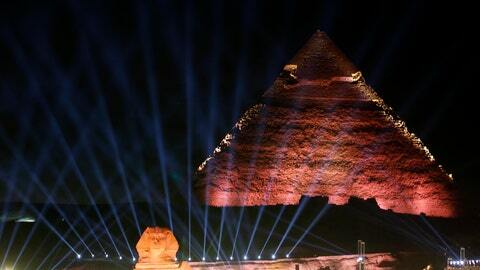 Friday night’s draw was held in front of the iconic Sphinx and pyramids of Giza, which were lit up by laser lights. Salah and Egypt reached the final two years ago in Gabon and led Cameroon before losing 2-1 to an 88th-minute goal. That was the first time Egypt had qualified since winning a record-extending seventh title in 2010. Senegal, Africa’s top-ranked team, starts against Tanzania, then plays Algeria and finishes the group stage against Kenya. Ivory Coast and South Africa, both former champions, meet in the opening round of games. Group opponent Morocco is led by coach Herve Renard, who is looking to win the African title with a third team after leading Zambia in 2012 and Ivory Coast in 2015. Nigeria, winner in 2013, appears to have one of the easier passages to the last 16 with newcomers Madagascar and Burundi in its group, although those lesser-known teams may have the advantage of surprise. Along with the three debutants, Kenya will play at the African Cup for the first time in 15 years and Tanzania for the first time in 39 years having made its only previous appearance in 1980. The top two teams in each group and the four best third-place teams will qualify for a round of 16. Previously, African Cups went straight to the quarterfinals after the group stage. Egypt and Zimbabwe kick off the tournament at Cairo International Stadium on June 21. The final is at the same venue on July 19.